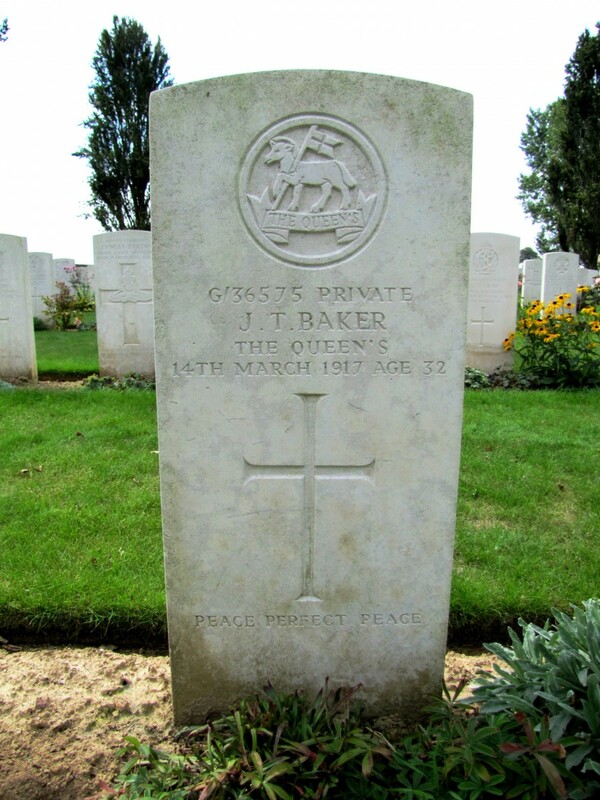 Joseph Thomas Baker was the 4th Ryburgh casualty of the month who died in France on March 14th 1917. He is another of those about whom we know very little save that he was married to a Little Ryburgh woman, Edith Nobes born in 1895 and the daughter of labourer James and Emma Nobes. In 1901 the family were living at May Green cottages. In 1911 Edith was working as farm servant to Henry and Louisa Toll. Toll is a name associated with Willow farm and they lived somewhere near to that area. Willow Farm as we knew it prior to its demise in the 1980's only existed as that separate single entity from 1920 when glebe land together with the farmyard and its land were purchased by Henry Toll's younger son Louis George. Edith had given birth to a daughter, Enid Lillian Nobes on July 19th 1914. Edith is described in the Baptism Register as from Westwood the farm where her father was employed. There are no clues as to who the father might have been. I have been unable to trace Enid in Ryburgh but she grew up and trained to be a nurse at the North Middlesex County Hospital 1937-40, further qualifying as a midwife in September 1942. She was working in the Sparham area at some point in the early 1940's. It seems she married Arthur Robert Turner, a heating engineer, in Hendon in 1947 and died on the Isle of Wight in 1964. James was admitted to Ryburgh school in May 1921 and left in October 1925 “removed to Snoring”. He married Daphne King in 1950 and lived in the Dereham area. His death is recorded in Dereham in October 1988. At the time of Edith and Joseph's marriage, he was listed in the Baptisms Register as a “munition worker”. Thanks to Jill Hyams, Surrey Heritage Archivist, we learn from the Surrey Conscription Registers that this was the case and that he was attested on February 7th 1917 at Kingston aged 33 years 5 months. He gave his address as 35 Westcote Road Streatham which was in fact the home of his brother William and his family. He was 5 feet, 7 inches tall and weighed 9 stones and 11 pounds. 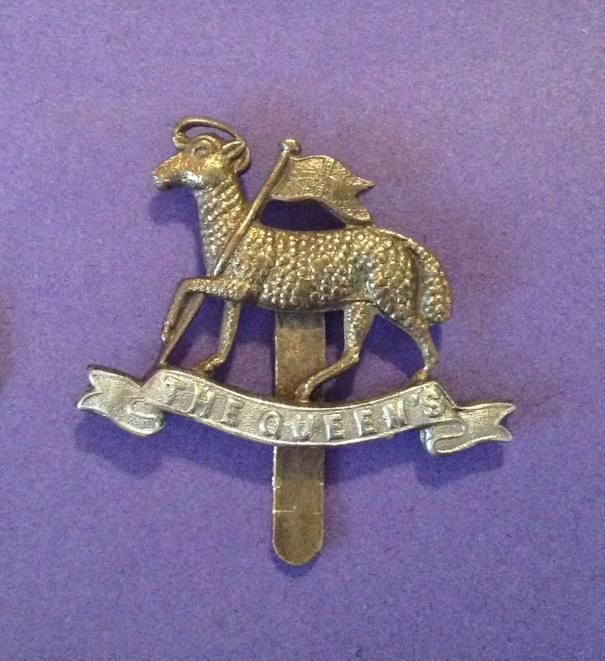 He enlisted with the 7th Infantry Labour Company of the Queen's Royal West Surrey Regiment. This resulted in his death just over a month later at the 43rd Casualty Clearing Station at Warlincourt in France. According to the Graves index it is said that Edith lived in Highfield Lane and that Joseph died of pneumonia on March 14th. The graves registration report form of 1920 however gives the date of his death as March 15th. His grave's reference is Vl.D.5 at Warlincourt Halte British Cemetery Saulty France. Edith was awarded his back pay of £2-9/-6d. October 2nd 1917 and a War Gratuity of £3 in 1919 and she continued to live in Ryburgh until 1925 as recorded in the School Register. She was later re-married to Sidney J. Peel in Dereham in 1930 and they had a son Eric born in December of that year. Joseph was entitled to the British War and Victory Medals, which have survived and are now privately owned. 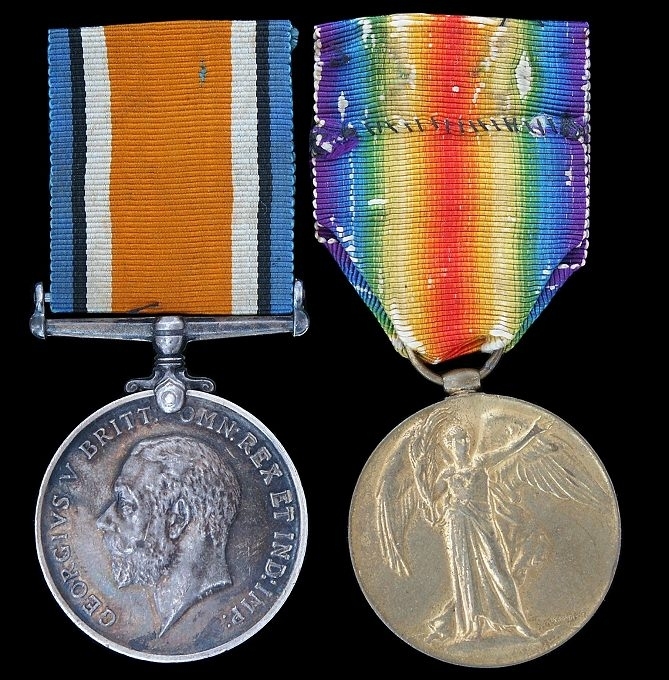 The photos of Joseph's two medals are reproduced below by courtesy of North East Medals, the auction house who sold them and due to the diligent web searching of Steve Bushby. 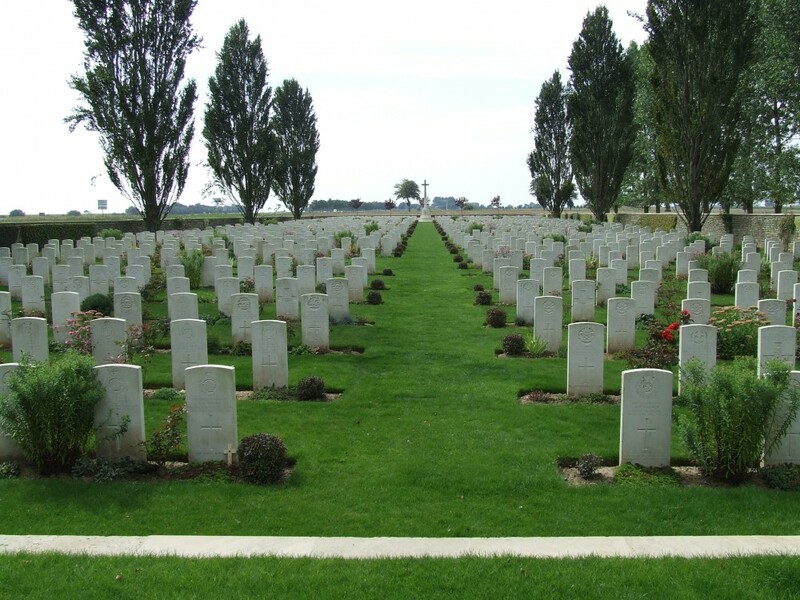 Joseph's name does not appear on the War Memorials at Wheatley or Waterperry in Oxfordshire where he and the family originated, nor in Streatham where he was employed. It is due to our researches that his name can finally be added to this special Memorial.